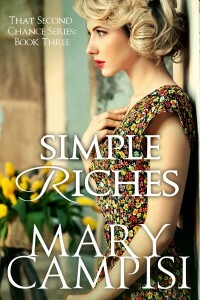 Simple Riches is only 99 cents! Limited Time Only. Just taking a quick break from A Family Affair: Fall to let you know that Simple Riches, Book 3 of That Second Chance Series, is on sale for the first time ever! Heartache, betrayal, forgiveness, and redemption, all wrapped up and waiting for you. If you enjoyed the small town sense of community and caring in A Family Affair (Truth in Lies Series) you’ll experience that same coziness in Simple Riches. Only 99 cents until May 14th. If you enjoyed the small town sense of community and caring in A Family Affair (Truth in Lies Series) you’ll experience that same coziness in Simple Riches. There’s heartache, betrayal, forgiveness, and redemption, all wrapped up and waiting for you. Simple Riches is Book Three of That Second Chance Series. (These are stand-alone books tied together by a common theme–belief in the beauty of that second chance. )Alexandra “Alex” Chamberlain is a big city girl who knows nothing about close-knit families, sibling rivalry, or receiving an unsolicited opinion in the name of family. She’s been raised by an aunt and uncle who’ve provided her with a wealthy lifestyle and a fancy education, but have withheld what she craved most–love and acceptance. Her uncle has taught her to disregard everything but the bottom line on a balance sheet and she’ll do anything to earn his approval. She prides herself on excelling at her job which is selecting small towns to buy, flatten, and replace with luxury resorts. When Alex decides to investigate Restalline, Pennsylvania, as a potential site for the next resort, she enters the town under the guise of a researcher gathering information for a documentary. Her uncle wants this project badly, and she’s not going to disappointment him.